Seeing that in a couple threads people are discussing the possibility that the Carl Rodd's trailer park moved, especially because of the power pole number 6. I created this thread to talk about it. It's clearly the same sign, just that this one is on the outer side of the the park and says 'New', and the old one points to the manager site and it's on the inside. So my guess is, yes, the trailer park was indeed relocated. Actually, on a second look. It is not the same sign, as the trout is no longer a separate layer of the sign, but drawin inside it. And it also has the manager pointing add-on. I just don't know what to think anymore. Thanks David. Looks like production details. The electric pole also has different details. Old one had two wires going up (one covering number 3) and bit different nr 6 (the new one is painted, old one was nailed). In my opinion Carl moved trailer park from Deer Meadow to Twin Peaks. 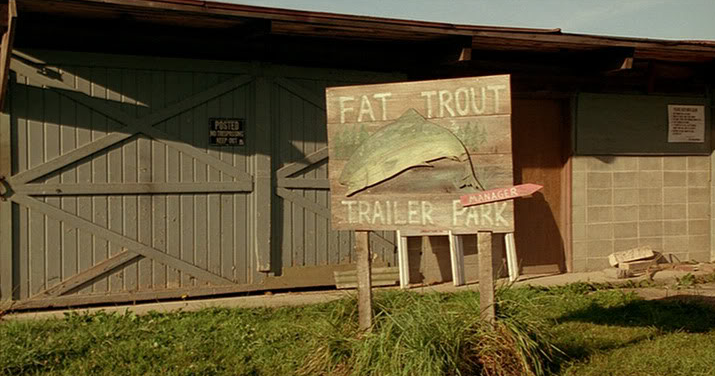 In the Secret History of Twin Peaks by Mark Frost, the Fat Trout Trailer Park is described as being "outside of Twin Peaks on he way to Wind River". Carl Rodd, after wandering around Canada returned to his hometown (of Twin Peaks) in the early 80s, "took up residence outside of Twin Peaks in a brand new trailer park". More than likely, it didn't "move". While on the distant outskirts, Peaks is/would be the closest "town" to it.
. . . we're not gonna talk about Judy . . In FWWM, the trailer park was in a different town, Deer Meadow, where Teresa Banks was murdered. In the pilot episode of season 1, Agent Cooper announces to the town hall meeting that it is at the opposite end of the state to Twin Peaks. I think David Lynch wanted to use the character Carl again, probably because he likes using familiar actors again. 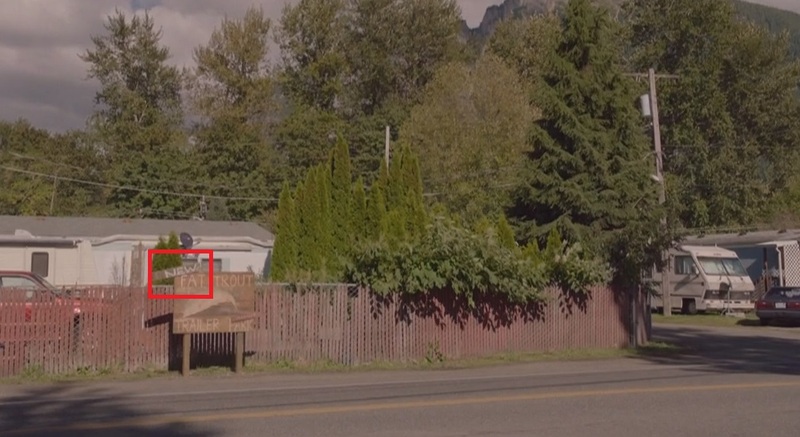 So they thought it was more convenient for the trailer park to be near Twin Peaks rather than the opposite end of the state, and they were hoping we wouldn't notice, or if we didn't notice, wouldn't mind. That text from Mark Frost's book rewrite's history to make it fit the story they are now telling. So it's not a case of the trailer park was once in Deer Meadow and at some point in the last 25 years moved to near Twin Peaks. The story is now that it has always been near Twin Peaks. The fact that Frost was not involved in FWWM and Lynch was not involved in the Secret History book might have something to do with it. It's like they have their own slightly different versions of the story in their own heads. are you assuming he was stuck in a Lodge for 25 years with a doppelganger of his out just like Cooper? Still to be determined. I think he is more in the Major Briggs category. Have to rewatch Fire Walk With Me. "See, I've already gone places. I... I just wanna stay where I am"
I think Rodd has been to the lodge. But has not been replaced by doppelgänger. Secret History says he disappeared along with Margaret (the Log Lady) so that would mean she's a doppelgänger too, which just does not sound right. I agree with an earlier post that it's similar to Major Briggs who went into the lodge and came back normal. These 'visions' that Cooper/Dougie and Rodd have (lights etc) explain the Log Lady's premonitions also I think. She is always right, and so far, Cooper/Dougie has been too. I do wonder if Rodd will have a big part to play or if that will be it from him now.